Last year I embarked on a journey of – what I, a big Doctor Who fan, called – regeneration. Not actually being a Time Lord from the planet Gallifrey (more’s the pity), it is an ongoing process rather than a blast of light and an instant transformation. What began as a declaration of freedom from a group of confining and judgmental people, has evolved into a continuing discovery and expression of the real me, and what suits the real me. I think that many of us who go the way of body art and modification aren’t merely rebels. Certainly there are individuals who fall into that category. But, for me, the outer transformation is a reflection of the inner person. This is me taking off the masks. I’ve discovered blue hair suits me. The most natural thing in the world. If my soul had hair, it would be blue. I’m a wild thing which has been royally fucked up by being born on this planet and forced to live here. I don’t cope or function well here. But, here I am, for now. 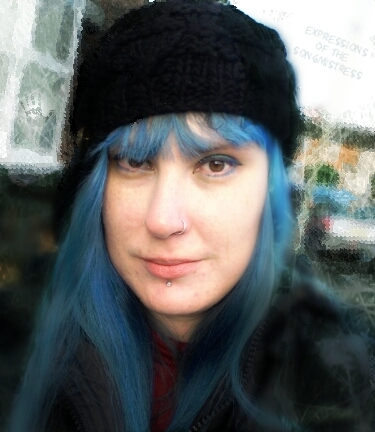 And, as long as I am, I choose not to hide, but rather to express, this tattooed, pierced, blue-haired soul. Not showing you all of my piercings. 😉 But, what I am showing is a doubly rare sight…well, a triple-y rare sight. 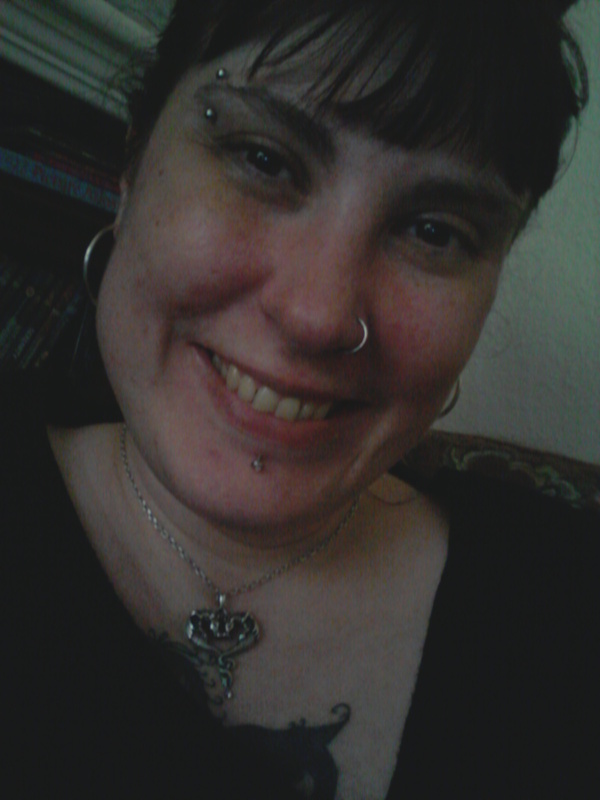 One, this is my face sans any makeup. Two, it’s an untouched photo. Three, I’m smiling. I feel comfortable enough in my metal face to show the world this (or, the tiny part of the world that pays attention to my blog…yeah, thank you, by the way). What some may deem a midlife crisis, I call a regeneration (ala Doctor Who). I’m becoming myself. Someone asked me what I was trying to prove with these piercings. I told her that I wasn’t trying to prove or make a statement to anyone. Other than, perhaps, that it isn’t a “certain type” of person who gets tattoos and piercings; I have always liked challenging stereotypes. But, these facial piercings are as much for me personally as the one I’m not going to show you is (I can’t show you, but, boy oh boy, I can certainly RECOMMEND the piercing to you). How people, wrongly or not, interpret the way I decorate the house of my soul is really not my concern. I am not my body. And, they are not my judges.